Get your bling bling on! whiteflash.com was so incredible to a sponsor a sweet and lovely giveaway to one lucky reader. 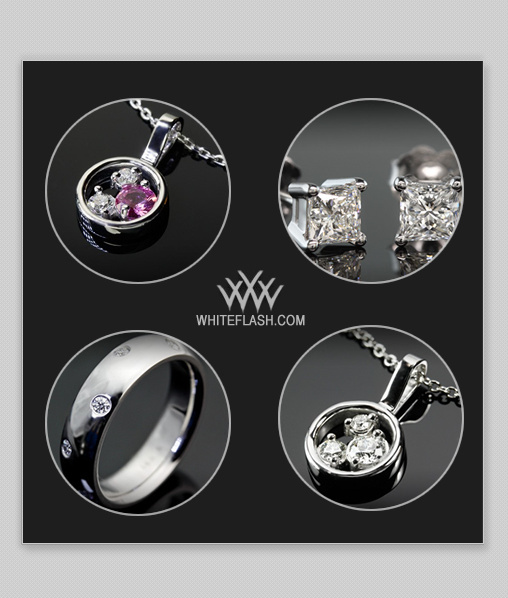 whiteflash.com houses an inventory of over 1000 diamonds, all of which have been personally inspected by their team of experts. All diamonds at whiteflash.com are certified conflict-free, secured through legitimate sources not involved in funding conflict and in compliance with United Nations Resolutions. We love that about them. FYI if you are looking for the ideal and superideal Hearts and Arrows diamonds whiteflash.com has the largest in-stock inventory online. Nice to know if that is the diamond of your dreams. Below are the items that you can win. 1) Akoya Pearl and Diamond Earrings 2) Princess Diamond Earrings 3) Scattered Diamond Band 4) Petite Dreams of Africaâ„¢ Diamond Pendant 5) Essence I Heart Diamond Pendant To win this super duper heck of a prize all you need to do is visit whiteflash.com leave a comment on what you would love to have from whiteflash.com and enter as many times as you like. Comments will close on Friday.